Ankle strength is important for many different sports, whether you are an avid triathlete, dedicated volleyball player, or even a ballerina. 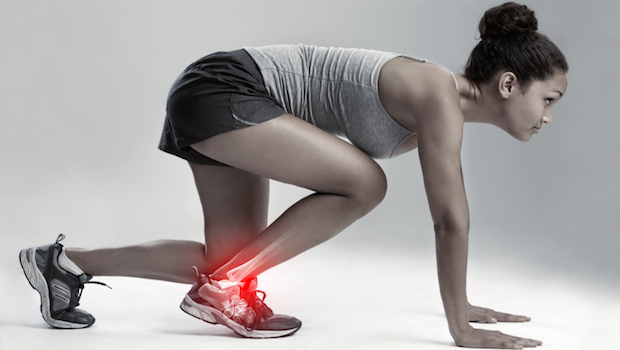 Having ankle strength improves your stability while you run, which makes you less likely to sprain your ankle. It also increases your strength when you are on your toes and it helps maintain balance. Improving your ankle strength can mean a new personal record on your run time. For this strengthening stretch, sit in a chair and raise your right leg straight out in front of you. Start writing the alphabet in the air with your right foot. Once you get through the alphabet with your right foot, switch and repeat the stretch on your left foot. For more of a challenge, trace a set of upper case letters and then a set of lower case letters before switching legs. Find a curb, step, or something sturdy that is the same height as a step. Stand with your toes touching the bottom of the curb or step. You should be facing the curb or step. Jump with both feet onto the curb or step and then jump back down. This will help improve your ankle stability and strength. You will probably need to build your wobble board for this, but not to fret; it’s super simple. You will need a board that you can comfortably stand shoulder width apart on, so not to narrow or short. Then in the center of the board you need a sturdy cylinder, about the size of a standard foam roller, but stronger. You want to make sure that you attach the cylinder to the board in the center. The last thing you want is for your board to break on you. Once you have a wobble board, one side of the board should be touching the ground and the other side should be in the air, like a teeter-totter. Stand on the board on the side that is touching the ground first, then step onto the board with your other foot. Balance on the board, keeping both sides of the board off the ground. Another way to strengthen your ankles with a wobble board is to teeter-totter on the board by shifting your weight from one side to the other. Like the ABC’s stretch, you will need a chair. Start by raising your right leg in the air. Slowly move your foot in circles clockwise, rest, and then with the same foot circle counter clockwise. Switch legs and repeat. This exercise is best done with a tall step. Stand next to the step with the side of your right foot touching the step and your left foot away from the step. Step up with your right foot, while keeping your left foot hovering in the air, and then step back down. Repeat on the same foot 15 times and then switch legs. Raise your right leg off the ground and bend your knee towards your glutes. Hold your right foot for better stability. Balance on your left leg and look straightforward. If this is tricky, try focusing on an object in the distance. Switch legs to work both sides. Once you have mastered balancing in one place, repeat the same exercise as above, but instead of looking straight ahead, move your head from the center to the left, back to the center, to the right, and return to the center before placing your foot down. Switch legs and repeat. For challenge mode, balance on one of your legs and move your head in the directions described above, all while keeping your eyes closed. These are also called elevés in ballet. Stand with your feet a little closer than shoulder width apart and slowly rise on your toes. Once you are balanced on your toes, gently lower yourself back to the ground. Repeat this stretch with your feet parallel a few times. Keeping your feet the same width apart, make your feet point outward like a V shape. Repeat this exercise with your feet in an outward stance. After you stretch with your feet in an outward stance, move your feet to an inward stance, like an A shape and repeat. Remember to take these stretches slow to prevent injury. Whether you are a marathoner, a triathlete, or someone who enjoys the occasional 5k run, ankle strength can improve your running time, while making it less likely of obtaining an injury. Remember to strengthen your ankles so you can improve your balance and stability. Ankle Strengthening Techniques- the main factor which should be taken into care for running and for other sports too.It helps us to increase speed for run and its working as an exercise too. I must have to say that chair concept explained by you is very good for Ankle Strength. Keep sharing this kind of information.